Everyone has access to our Creative World, however there are special rules for the world. 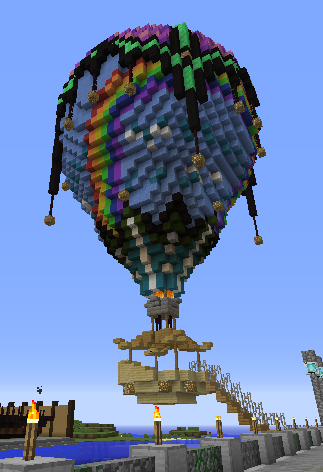 To get to Creative take the hot-air balloon from the Shipyard docks. Players can fly in Creative and have access to their creative inventory. The server rules still apply in this world. This means that you are not allowed to use lava, TNT or spawn eggs, even though they appear in your creative inventory. If you try to use them, they won’t work and all of the staff members will be notified of your attempt. You ARE allowed to use fire in this world so that you can light fireplaces in the buildings that you make. Do not abuse this ability. No redstone contraptions without an off-switch. Any redstone items left on will be removed from the game and you may lose access to Creative World. No spawning snow golems or iron golems. Just avoid the temptation. No one needs an army of golems. I promise. No setting up contraptions with the express purpose of using a banned item (e.g., no dispensers filled with spawn eggs). If you are found doing this, you will lose access to the Creative World. No judging or being mean about something someone else built. We all have different things we’re good at. Only 1 beacon per person. Protect your area in Creative with a diamond ore.
No running/pouring water on/off builds. Grab a Diamond Ore from your creative inventory and place it on the ground. TADA! You have now protected an area that is 41×41 blocks. Check out the pdf file below for specific commands to use inside your protected land. This pdf file: Blocklandia commands – creative world contains all of the above information and additional commands specific to the Creative world. The Squire's job is to help out around the server, answering peoples questions, etc.